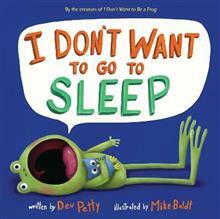 DEV PETTY is the author of I Don't Want to Be a Frog, I Don't Want to Be Big, and There's Nothing to Do! A graduate of the University of California, Santa Cruz, Dev previously worked as a visual-effects artist in film, contributing to such movies as the Matrix Trilogy. Dev was born and raised in Berkeley, California, and now lives right next door in Albany with her husband, two daughters, some dogs, and other critters. Visit her online at devpetty.com and on Twitter at @devpetty.MIKE BOLDT is an author and illustrator living in the countryside of Alberta, Canada. He has illustrated many books for children, including the picture books I Don't Want to Be a Frog, I Don't Want to Be Big, and There's Nothing to Do! When he's not drawing, he's building snow forts and Lego spaceships with his three kids, or sharing laughs and his ice cream with his wife. He is very glad he's not a frog. Visit Mike online at mikeboldt.ca and on Twitter at @MikeBoldt.